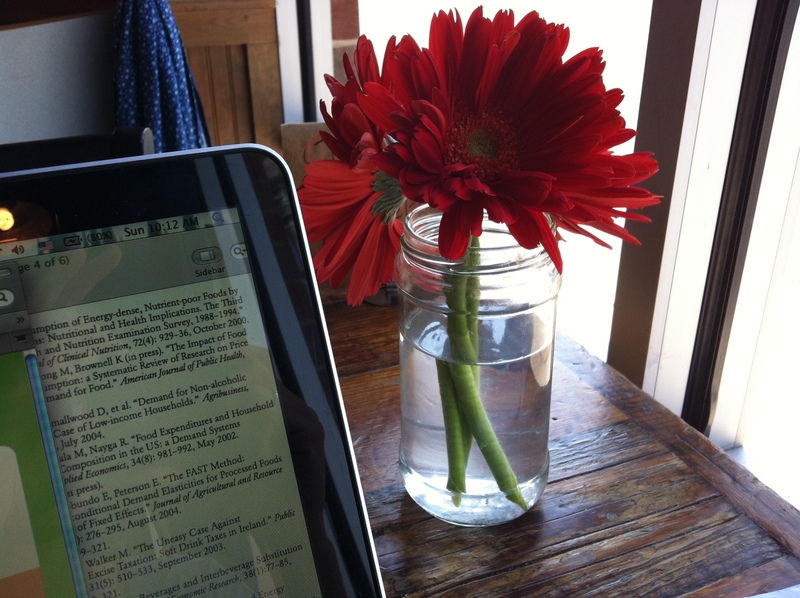 Enter your email address to subscribe to this blog and receive notifications of new peanut posts by email! My goodness, its been a week since the Disney Marathon!! Sorry for the late recap. We were stranded in Orlando until Wednesday night and I started my internship at Children’s Healthcare of Atlanta on Friday!! And so the New Year begins!! 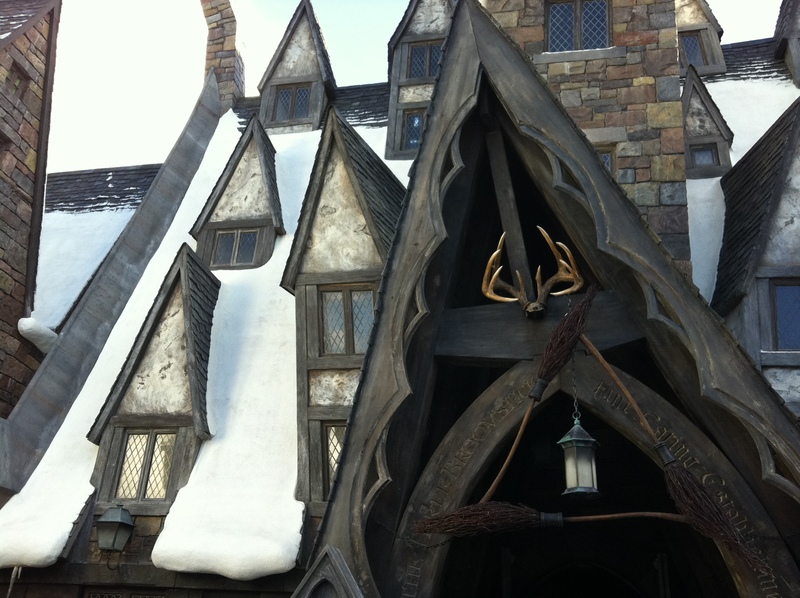 Last Thursday we arrived in Orlando after an easy breezy 8 hour drive south! 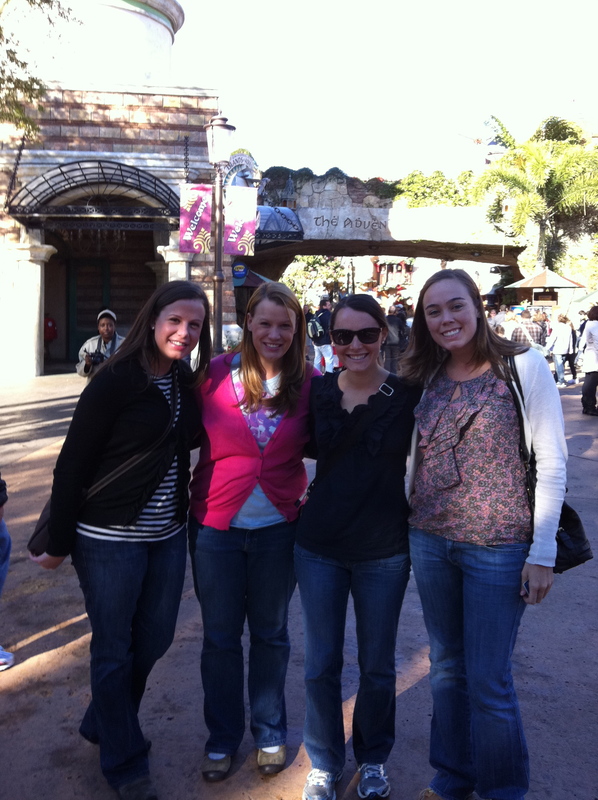 Great friends and good old fashion Disney anticipation makes the hours fly! 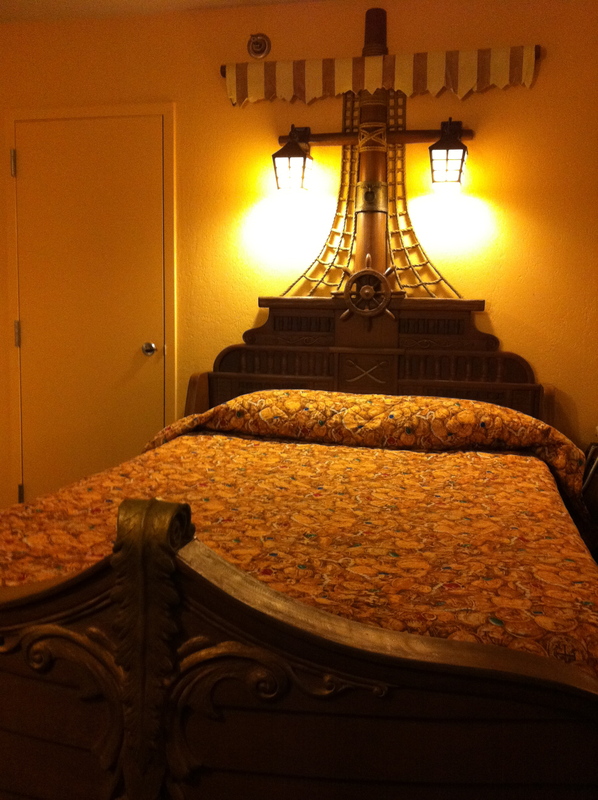 We checked into our pirate themed room at the Disney Caribbean Beach Resort!! This themed room has ruined all other hotel experiences for me. 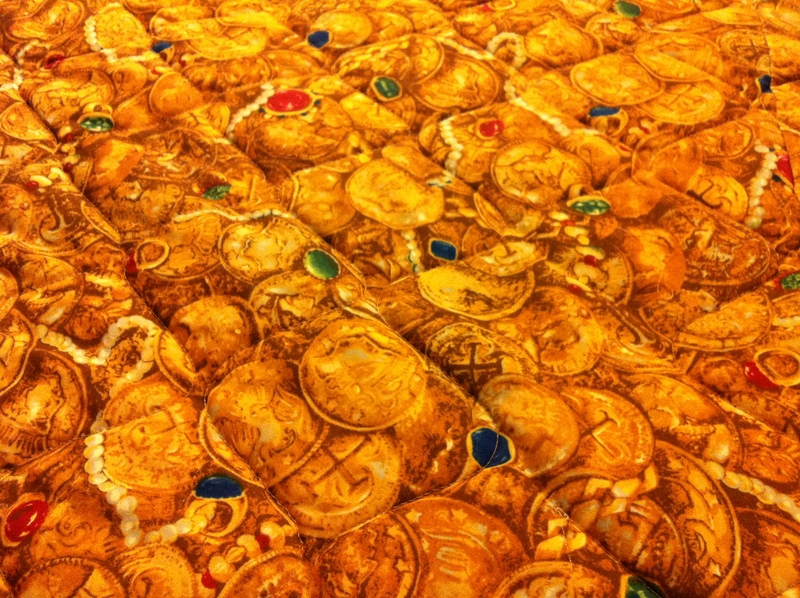 How can I go back to plain bed spreads and solid color curtains?? 😉 Actually by the end of this Orlando adventure, I will have stayed in 3 different hotels! 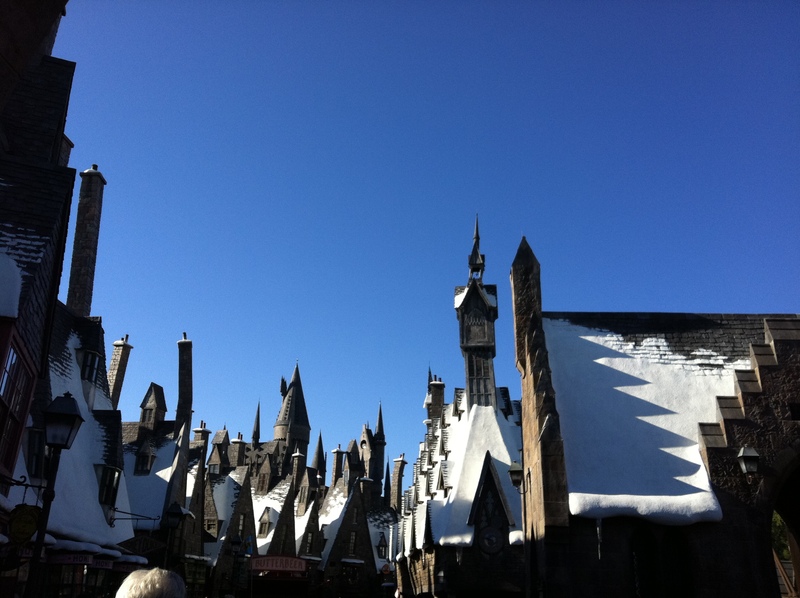 We woke up bright and early to be at Universal Studios Islands of Adventure before the crowds! 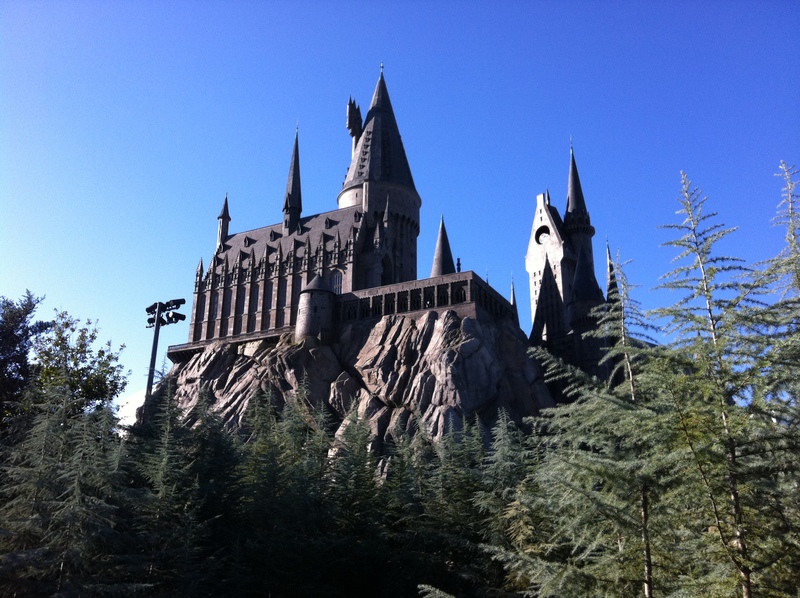 We powered through the park to get to the Harry Potter section, stopping only breifly to take this picture. I was so glad to be in the company of fellow speed walkers! 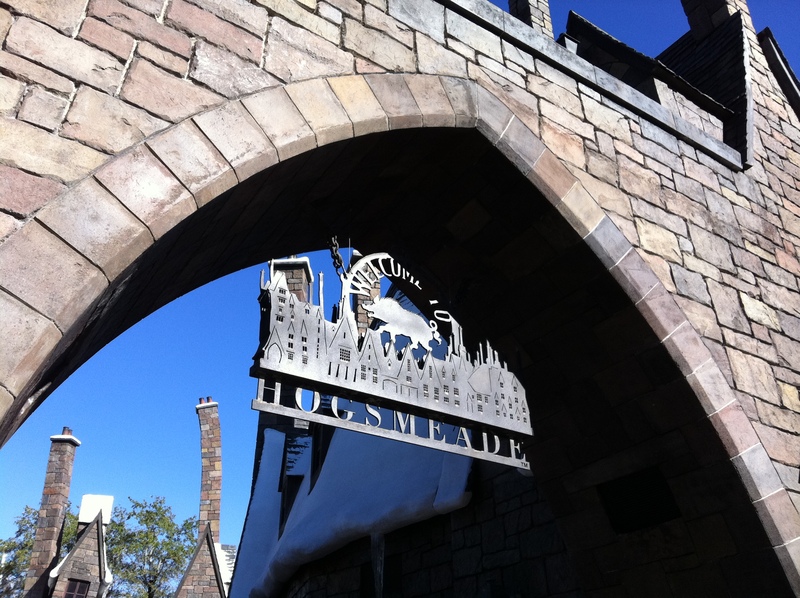 Im not ashamed to admit that I regressed into an excited wide eyed kid as we entered Hogsmeade! It reminded me of cream soda with whipped cream on top. 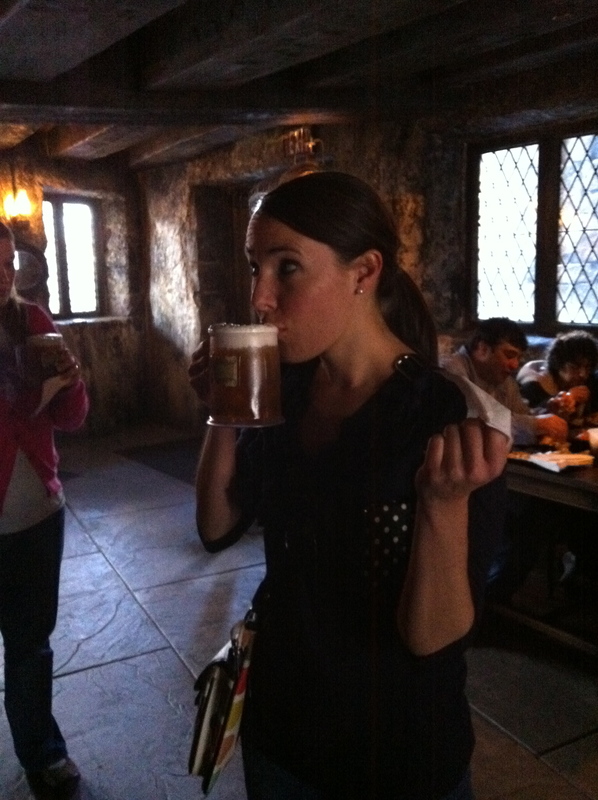 It was pretty sweet so I didn’t drink that much, but it was well worth the experience! After riding a few rides, we were off to the race expo at Disney’s Wide World of Sports! 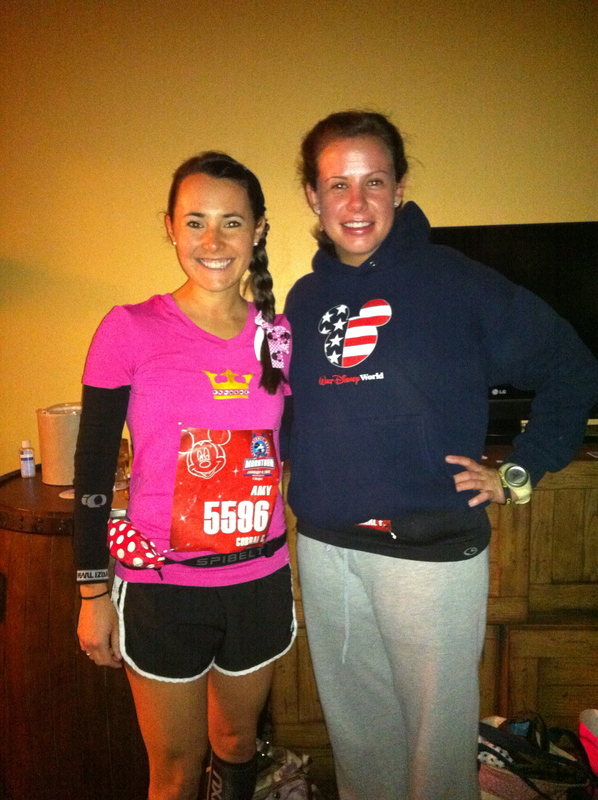 The next morning was the Half Marathon that Lauren F. and Kelly were running in! Unfortunately I don’t have any pictures. The journey to see the race could be a blog post all to itself! Short Version: we took a bus, boat, and taxi and were only able to get there in time to see the girls after they finished the race! The rest of the day we relaxed, saw a movie, and met the parents for a fabulous carb-filled dinner!! We tried to go to bed early but 3 am comes early regardless of when you went to sleep!! I actually popped out of bed. I was super excited and ready! We caught the 3:45 bus for Epcot. Got there in time to stretch and hit up the bathroom (aka port-o-pot) before heading to the start. It was early and it was cold!!! My teeth chattered while I waited in my corral. Within the first half mile though I was settling in and the temp was actually perfect! I spotted my parents a miles 2, 12, and the finish. They were holding up these orange and blue straws that helped me spot them!! It was so nice to have them there! It is amazing how much a support crew lifts you up and carries you on! The race itself was a blast! We started off running through Epcot in the dark, underneath the big Epcot ball. This was probably my favorite part of the race. It was so beautiful lit up and it was fun running in the dark. My first mile was around 9:45 and then once I got settled in I averaged around a 8:50 min/mile pace. I felt good, really good! I told myself that I would hold onto that pace as long as I was not hurting too bad. The sun came up as I was running into the Magic Kingdom! We came through the super secret back lots and out onto main street. Looping around the park and through Cinderella’s Castle!! Onward to Animal Kingdom where I ran past donkeys and the Tree of Life 🙂 Our final trek was through Hollywood Studios (we ran through the building where they make the character costumes! So stinking cool!). At this point, it was around mile 22 and I was a little tired of the whole running thing. But I knew the end was getting so close! 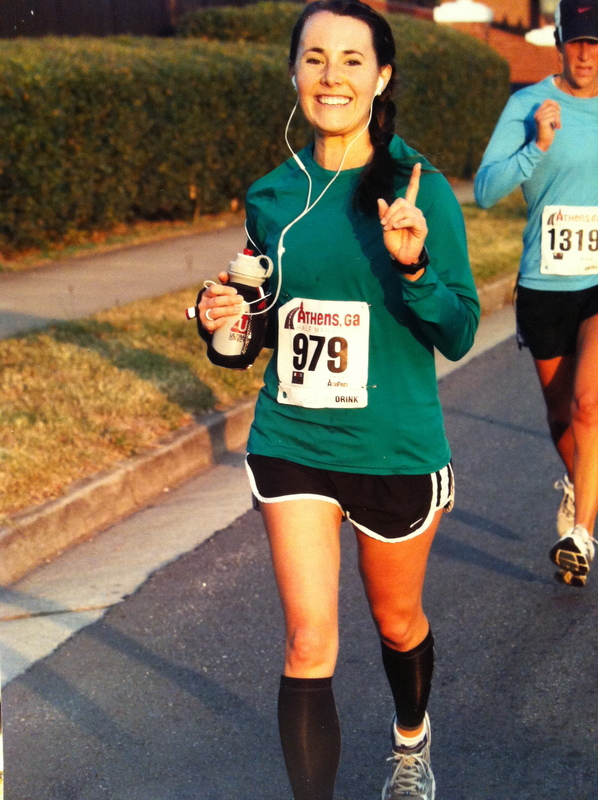 Marathon running is a mind game. Yes you have to do the training but no matter how much training you do, you have to keep your mind in a place to continue on for 26.2 miles. When your body is tired and telling you that you have exceeded the amount of miles that is reasonable. I was flying high not a care in the world until mile 13. Then I start thinking about the finish. I had to get my mind back to where I currently was. Mile 20, my legs are screaming. At this point I know looking at my watch that if I run every mile under 10:00 I can finish sub 4:00. This is HUGE! I had been keeping a stead pace but while running my brain power is concentrated on keeping myself moving forward, adding times and calculating pace is not something I am capable of. With this knowledge I push forward. Hurt muscles heal, but sub 4:00 marathon!!! That is something I dream of! From Hollywood studios we ran around the Epcot resorts and back into the park. Mile 24, mile 25….where the heck is mile 26???? Did I miss it, why is this mile so much longer than the others?! Did they measure this out right?! Finally I turn a corner and I see the 26 mile marker, then the finish is in sight. There are grand stands set up, I feel like I am running down the fairway of the 18th hole in Augusta! I run past the crowds and catch a glimps of orange and blue! I see my parents up front yelling and waving! I know I have sub 4:00, I am almost done, my mickey metal is within reach. With that I speed across the finish line. 3:54:26!!!!! What a feeling!! I was handed my metal (talk about race bling!) a mylar wrap, bottle of water and directed to the runners meet up section where I find my parents. I am almost speechless. I so far exceeded my expectations and despite my broken down legs, I feel GOOD!! We headed over to the finish to watch my brother Charlie and his girlfriend Erica finish. Then we met Lauren at the runners meet up section! Way to go Charlie and Lauren on completing their first marathon!!! We stayed that night at the hotel in Celebration. When ice covered the state of GA and all hopes of traveling back were postponed, we moved to the Embassy Suites until we were able to head back on Wednesday morning. 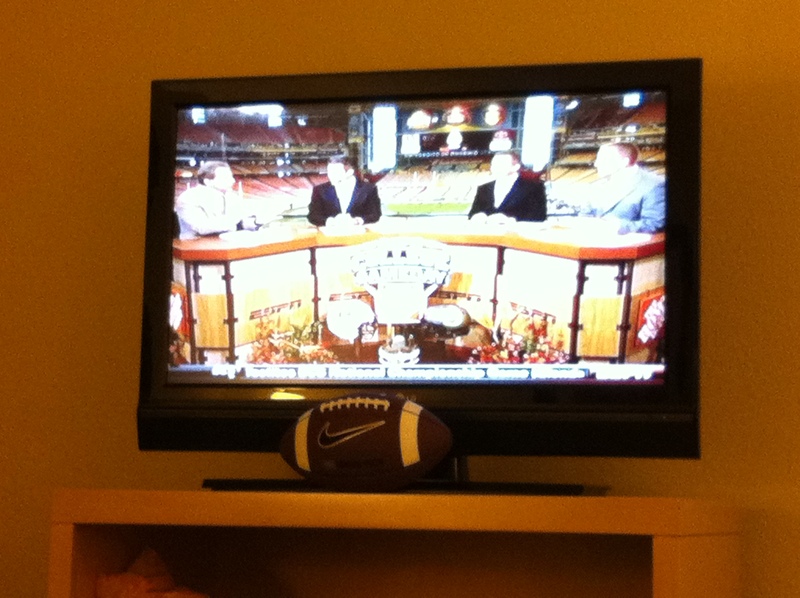 Thankfully they had a nice TV to watch the National Championship on! 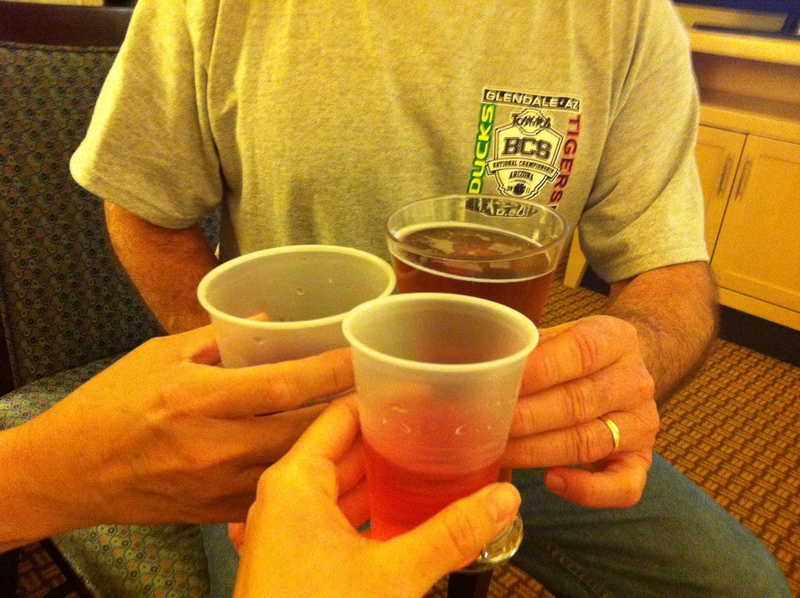 Cheers and War Eagle!!! National Champs 2010-2011!!! and now I get to begin planning for the Paris marathon in April! Thanks Tina!! They are so fabulous at CHOA, it is an amazing organization to work for! Oh my – what a finish!! You sure rocked that race! Thats what I am calling myself these days. Gimpy, the Seven Dwarf’s limp-a-long friend. The limp is the aftermath of a personal record shattering run. I ran the Disney Marathon in 3:54:26!!!! The race was truly 26.2 miles of magic, and I enjoyed every theme park, pavement pounding moment! I just got back into Atlanta after being stranded for 3 days due to a thick sheet of ice covering the whole state of GA! This gave me some time to relax, let my parents buy me things, and ice my knee! I am working on a full recap of the race. To be continued…. Congrats! That’s awesome! I hope your knee feels better soon! Wow – that is a FANTASTIC time – you go, girl!! Congratulations (and take care of that knee)! Congrats Amy! You did so awesome and I’m so excited for your awesome time!! Thanks lady!! It was such a blast and totally worth the hobble 🙂 Miss you oh so much!! …shoes are in my pack, there’s no turning back! Hi Ho-Hi Ho-Hi Ho Hi Ho!! This rhyme actually took me a long time! There is not a whole lot that rhymes with articles of race gear 😉 We are off to Orlando tomorrow!! I will try to upload some pictures while we are there, if not then there will be a FULL recap when I get back. 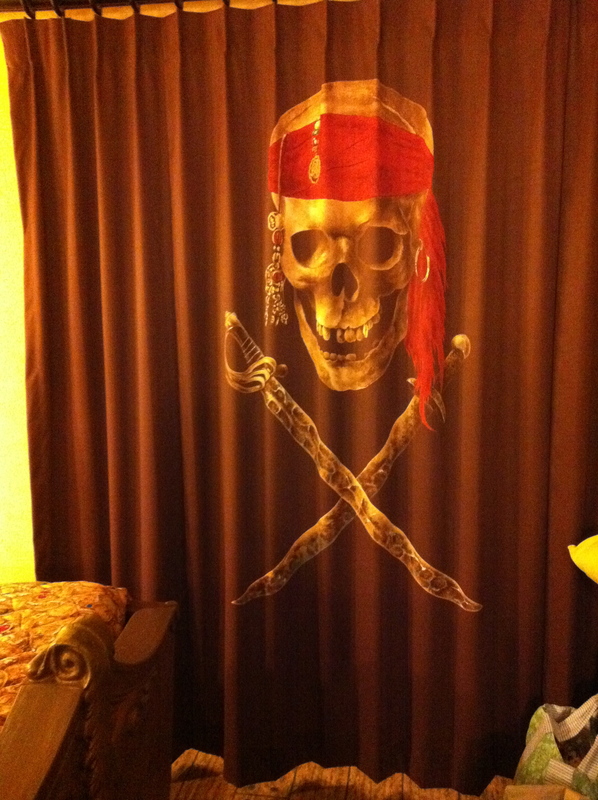 Did I mention that my friends and I are staying in a pirate themed room?! 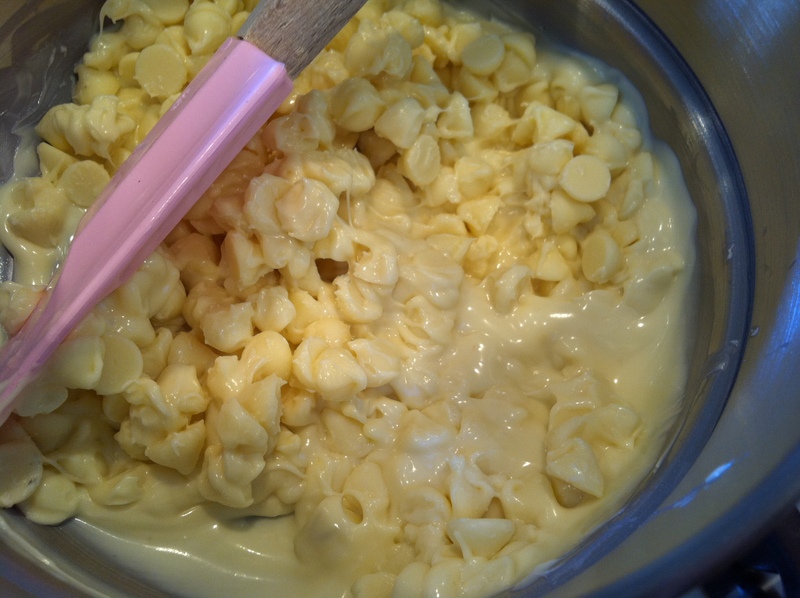 M-I-C-K-E-Y (Y? because I love you!) M-O-U-S-E!! Right now it says low 54 high 65! PERFECT running weather if nothing changes!!! 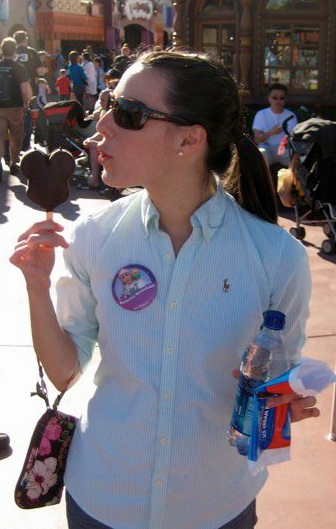 Thanks for commenting on my blog – I’m so excited to see that you’re running Disney!! Good Luck Amy! Plan on a post race turkey leg? Hope you get back in time for the BIG GAME. 5 days to be exact, I will be running my second marathon. This time at Disney World! How exciting!! And how fun to run it at the happiest place on earth! 🙂 I’m sure you’ll do great and I’m sending good thoughts. Now, I have the Mickey Mouse song in my head. haha loved that article, thanks for sharing! I love the beginning of a new year! All the hope and excitement that it brings! And for me it also brings A LOT of change! Running a marathon in Paris!! My sister is having a baby! 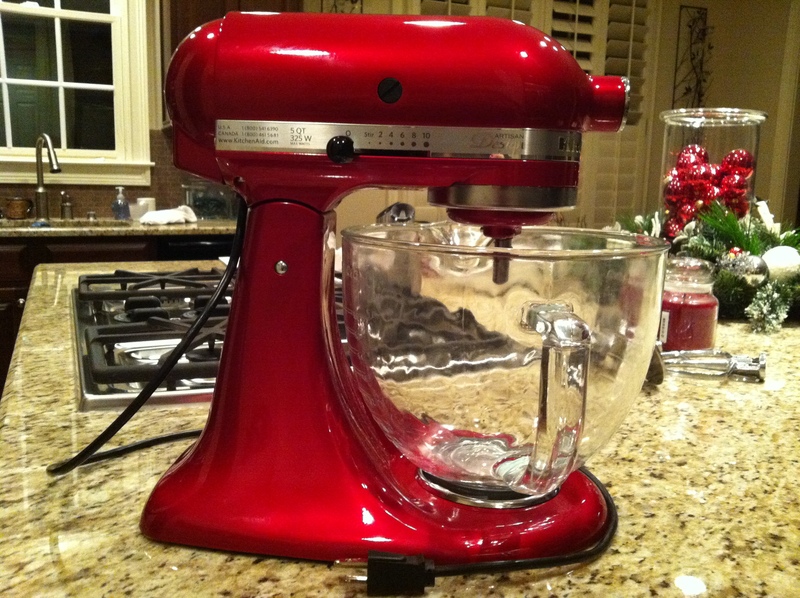 It also brought the purchase of a new Kitchen Aid Mixer! Isn’t it beautiful!!! 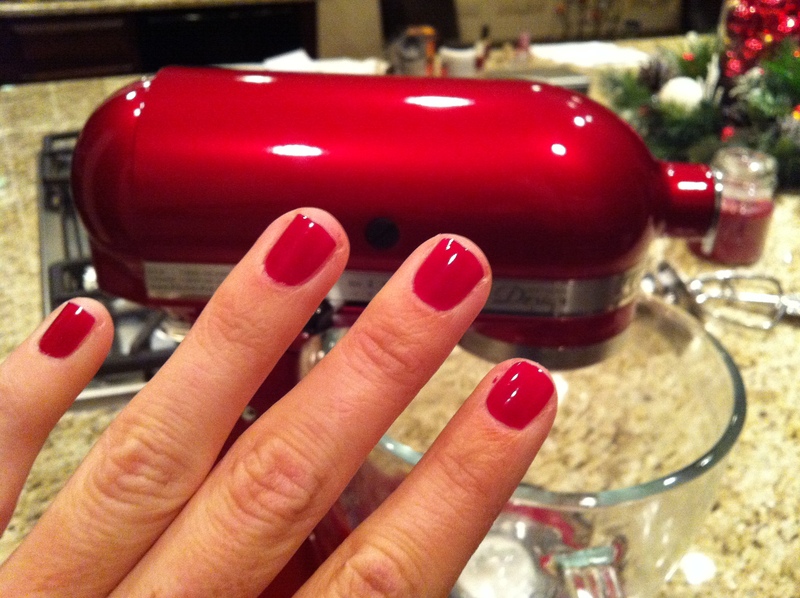 I have wanted one forever, and with my discount at Williams Sonoma there was no better time to get it! I tore open the box as soon as I got home! I decided that bread should be the first thing I make with it! 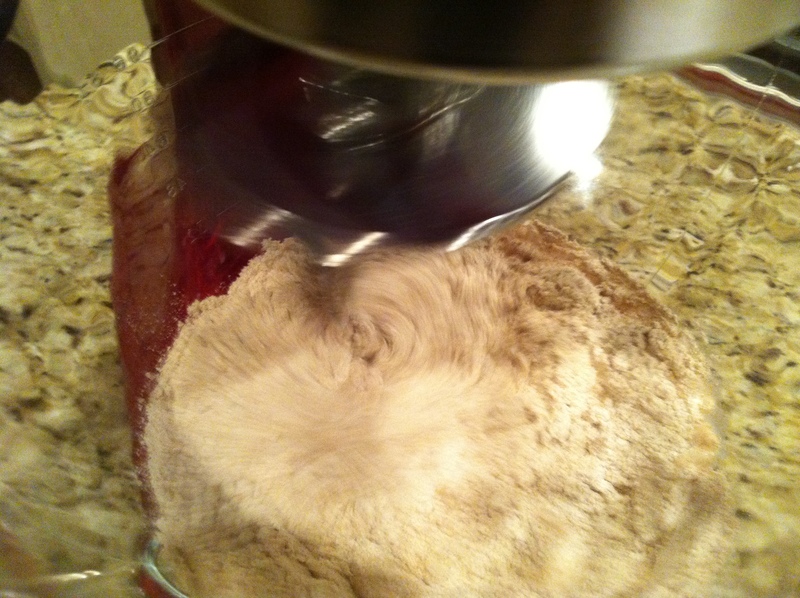 The mixer comes with a sweet bread hook and really, what is better than fresh bread?? 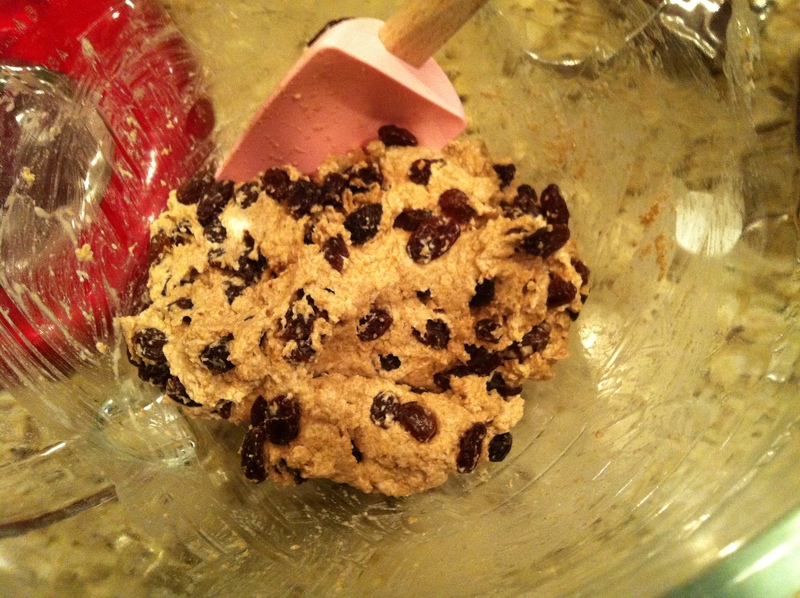 My foodie friend Jake gave me a recipe for Whole Wheat Cinnamon Raisin Bread! 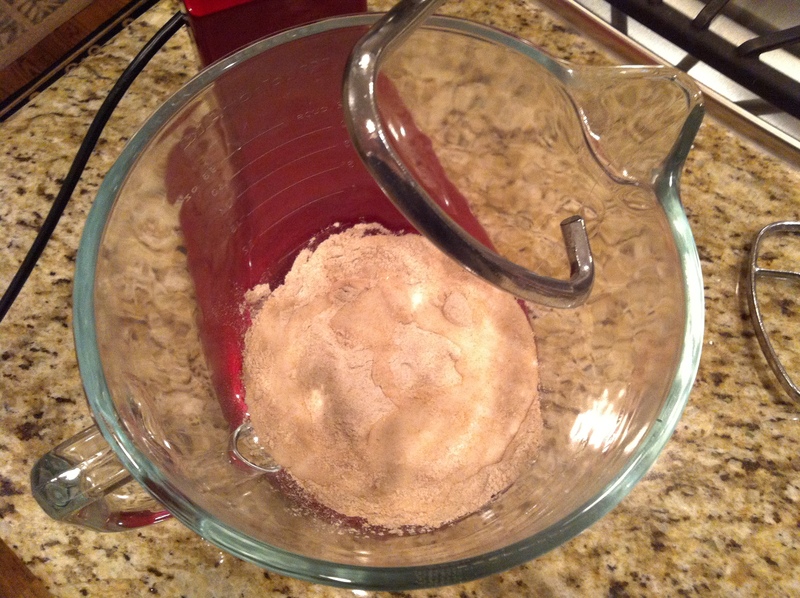 The dough has to rise overnight. 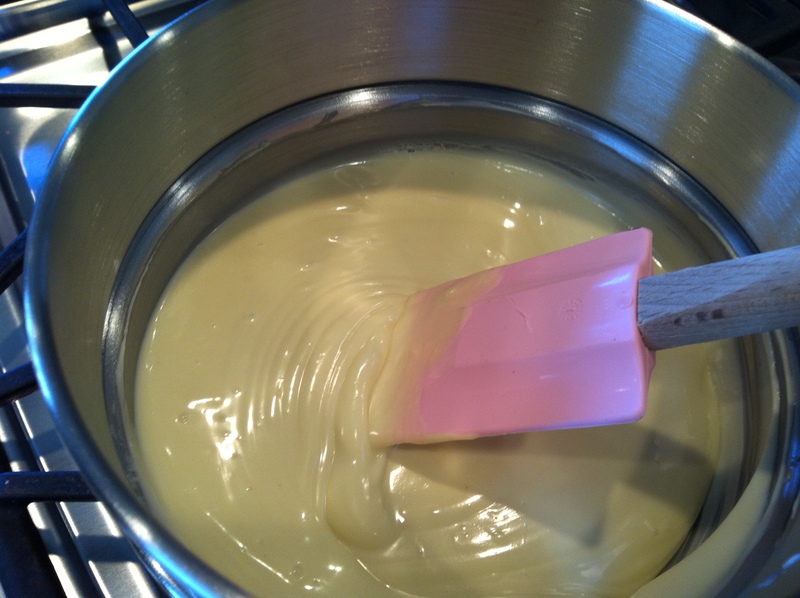 I will post the recipe and final product soon!! One week from today is the Disney Marathon!! 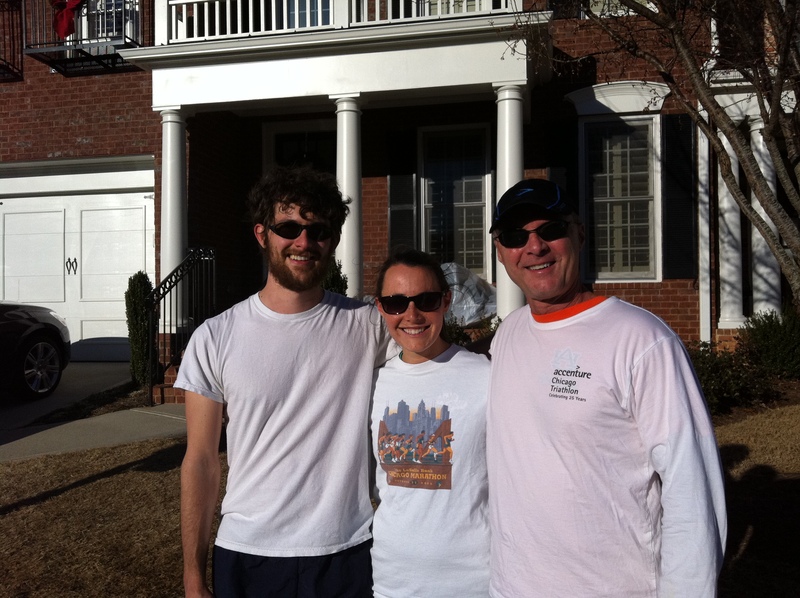 My dad joined my brother Charlie and I for our 3 mile run today. Let the tapering begin!! I have a mix of 3 and 2 milers leading up to the race. I am getting so excited for Disney, I can’t stand it!! 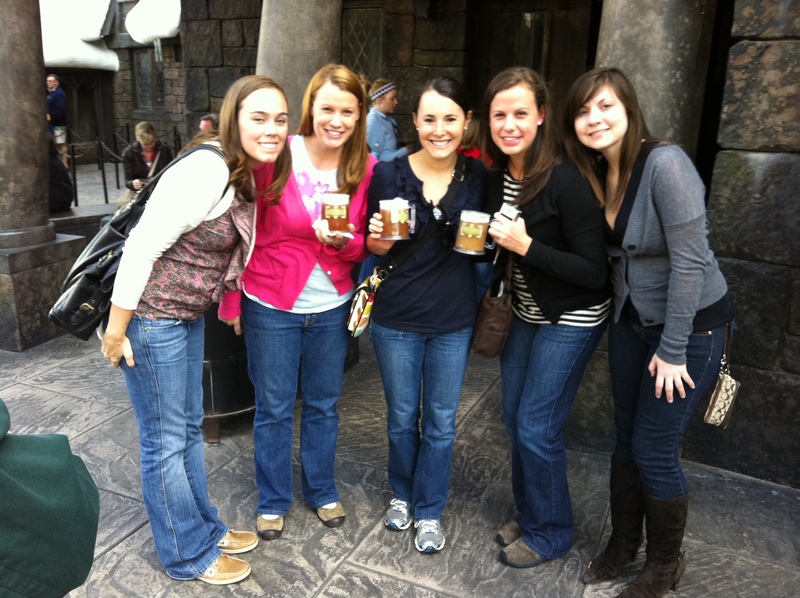 Friday: Bright and early is The Wizarding World of Harry Potter!! 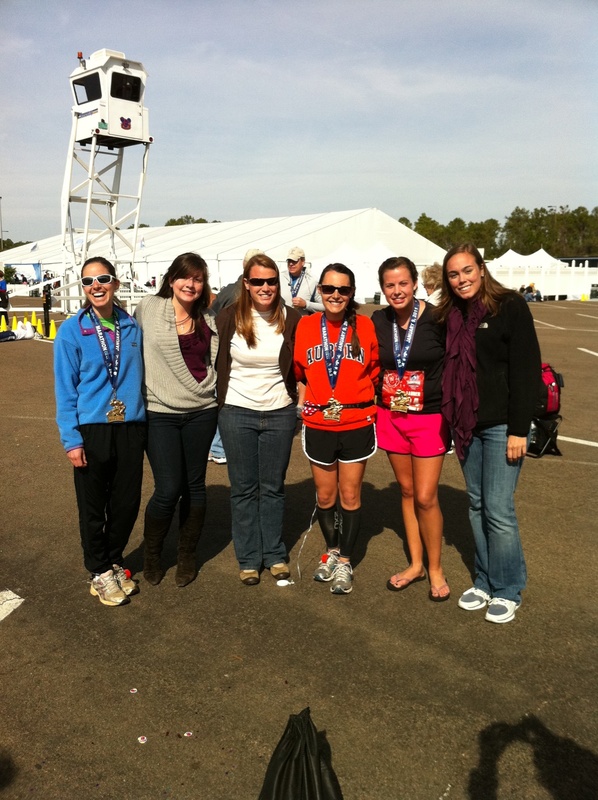 Saturday: Is the half marathon where we will be cheering on Lauren F. and Kelly! Sunday: Lauren, Charlie, Erica, and I are running The Disney Marathon!!!! Monday: Disney in the morning then traveling back home to watch AUBURN in the national championship! Woo hoo!! I got a shout out in the blog!!!!!! Harry Potter then the race?! That sounds great… you kids have fun! Yesterday was our 20 mile long run, a little (or a lot!) of rain and ice could not stop us!! 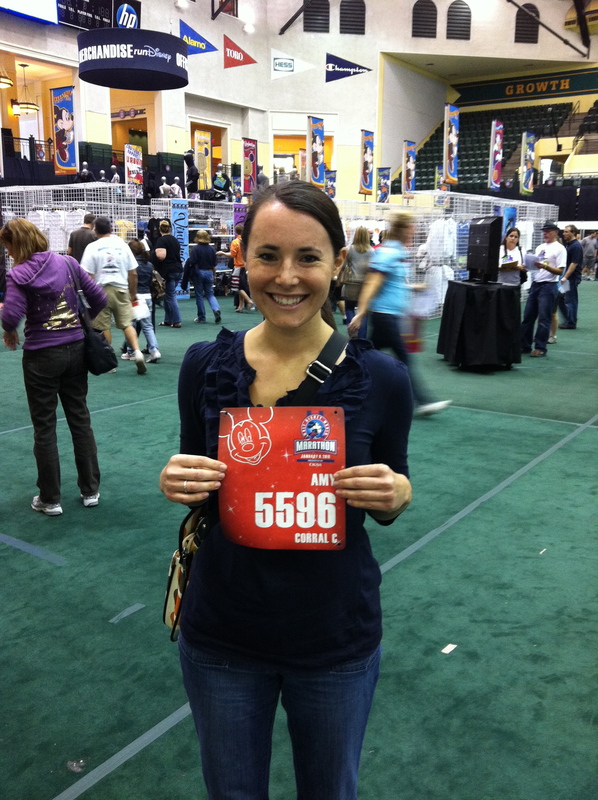 I am so ready to run 26.2 through Disney!! Only 22 days to go! 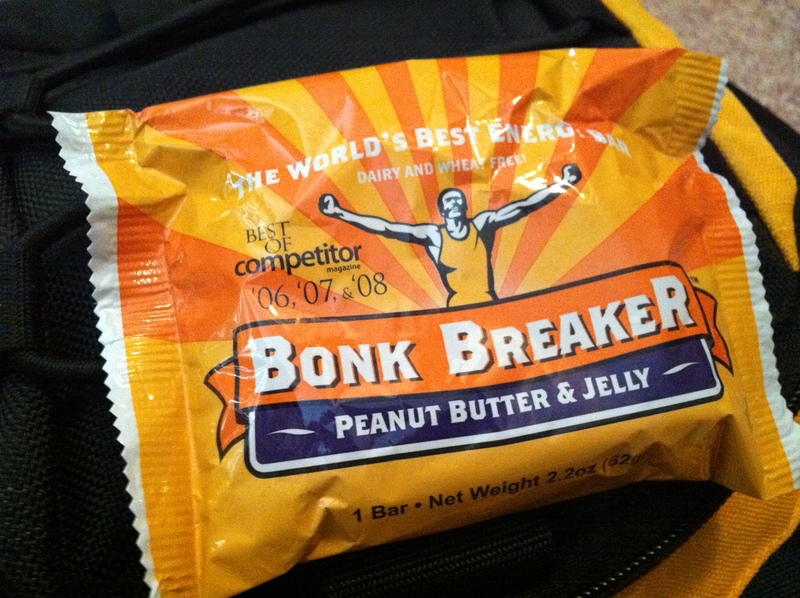 Bonk Breaker’s are my newest favorite energy bar 🙂 I LOVE peanut butter and jelly. 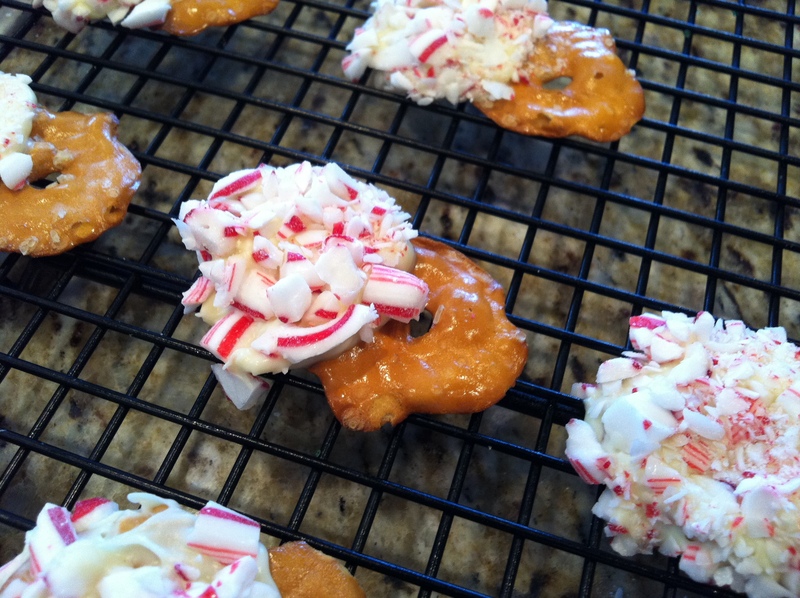 These are yummy and so easy to eat on the run! It is oh so nice to be home!! 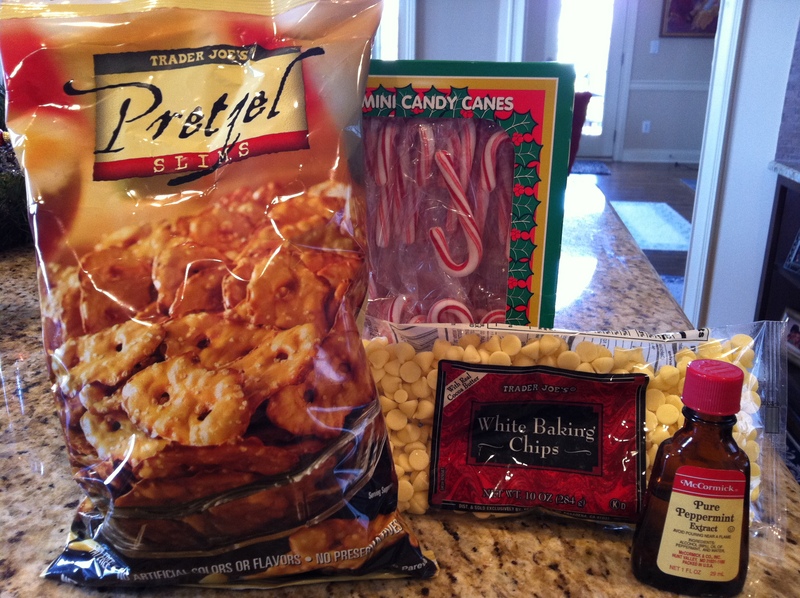 Inspired by the Trader Joe’s version, which sadly the stores are out of! 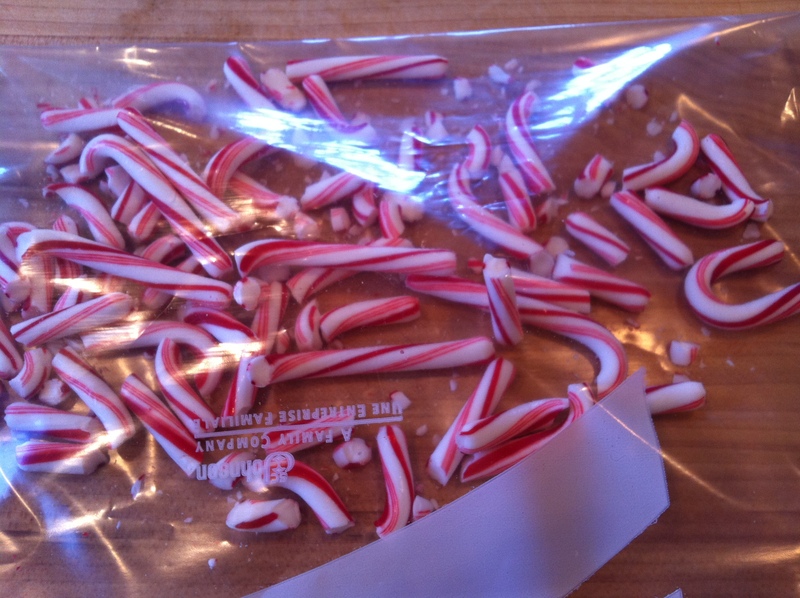 Crush the candy canes, very finely. 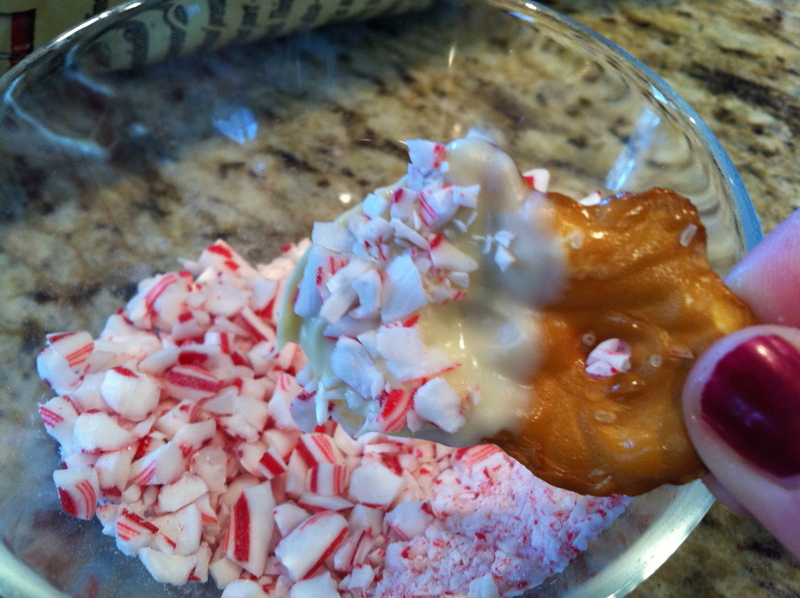 Melt the chips in a double broiler and add in 1/2 tsp of peppermint extract. Then let them cool and harden up on a cooling rack. If you can resist them that long! I think that I would pick these over TJs any day! 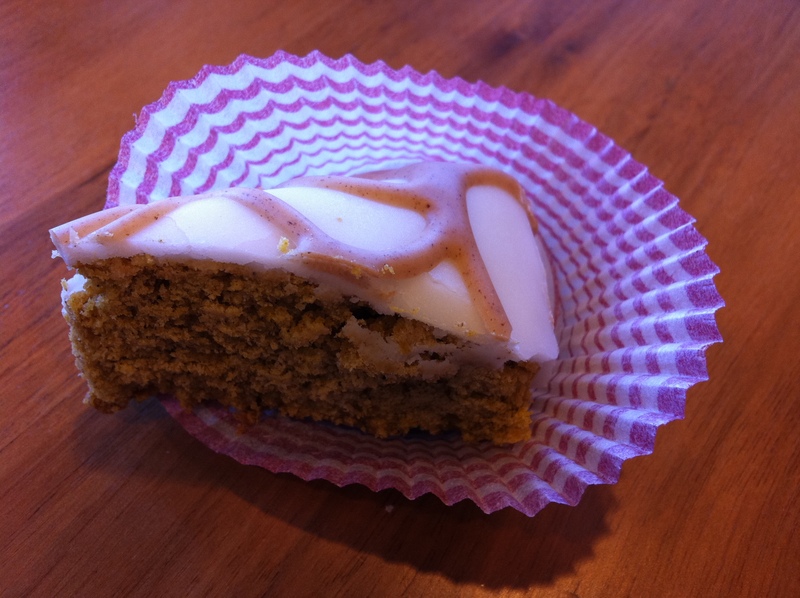 Home made treats are the bestest!! 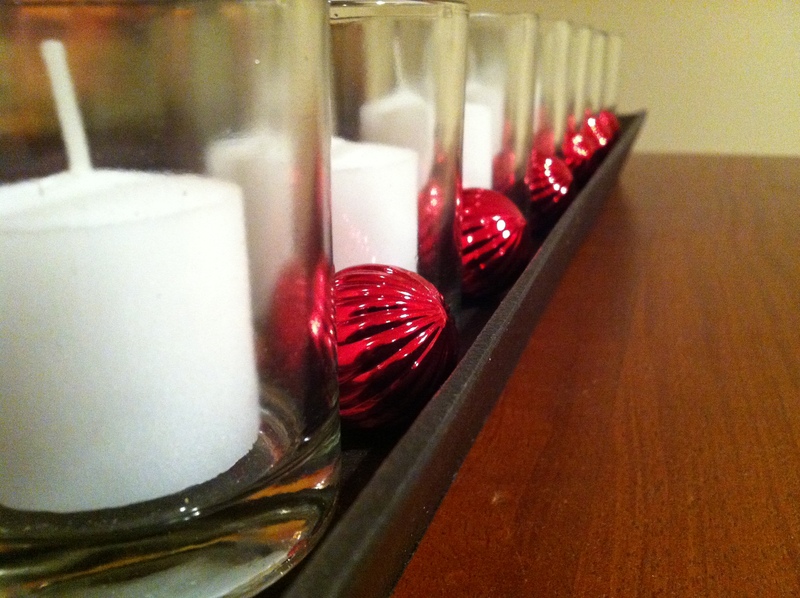 Only 1 week to Christmas!!! 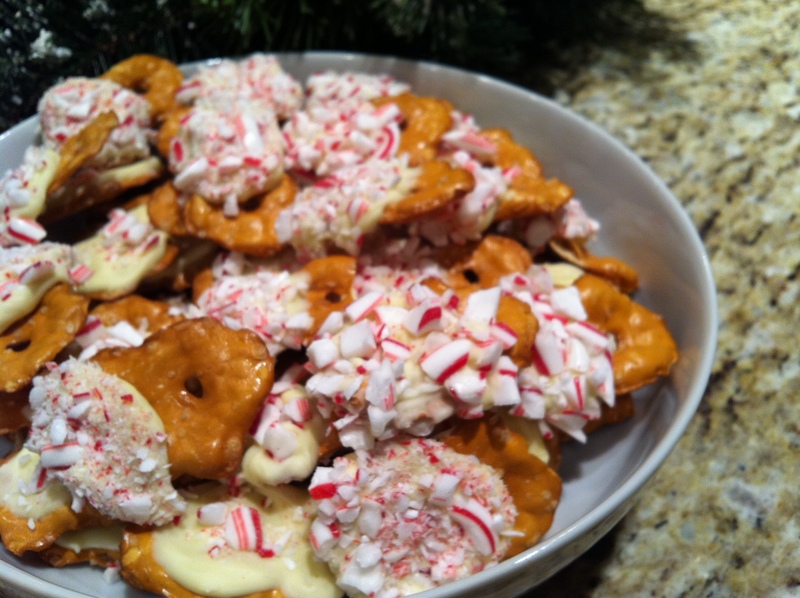 What are you favorite things to make during the holiday season? Yes, Moms do love it when the kids are home. Brent came home last night. I think there are 7 guys sleeping downstairs this morning. 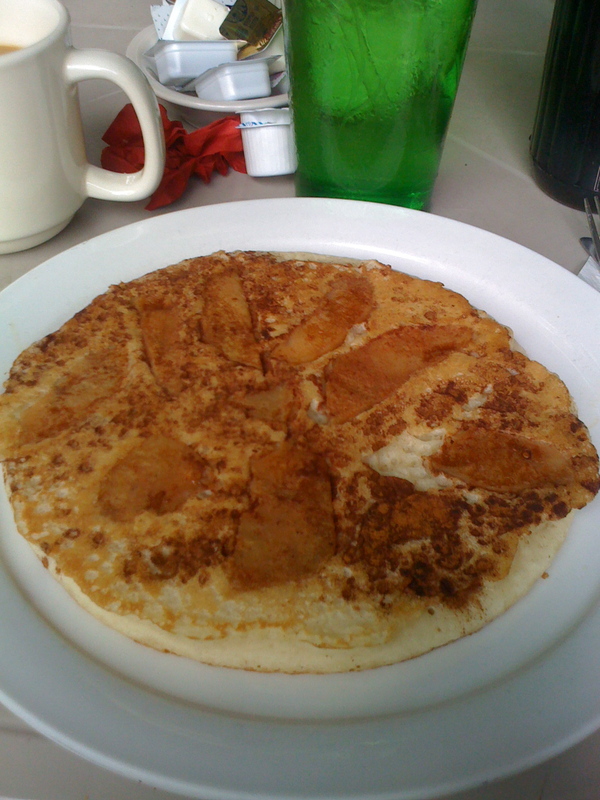 Wish I had you here to make one of your healthy, gourmet breakfasts!!! A.K. I love being home and being taken care of 😉 Good luck with the boys!! Ummm yeah! You’re sorta like a rock star with the running! 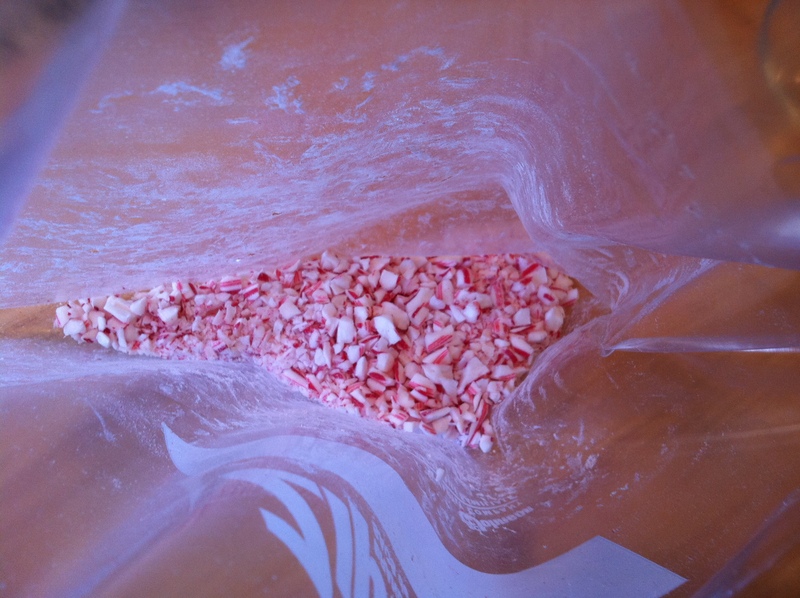 For Christmas, I break out the peppermint, which I don’t typically prefer anytime else, and mix it with hot chocolate! Wow! 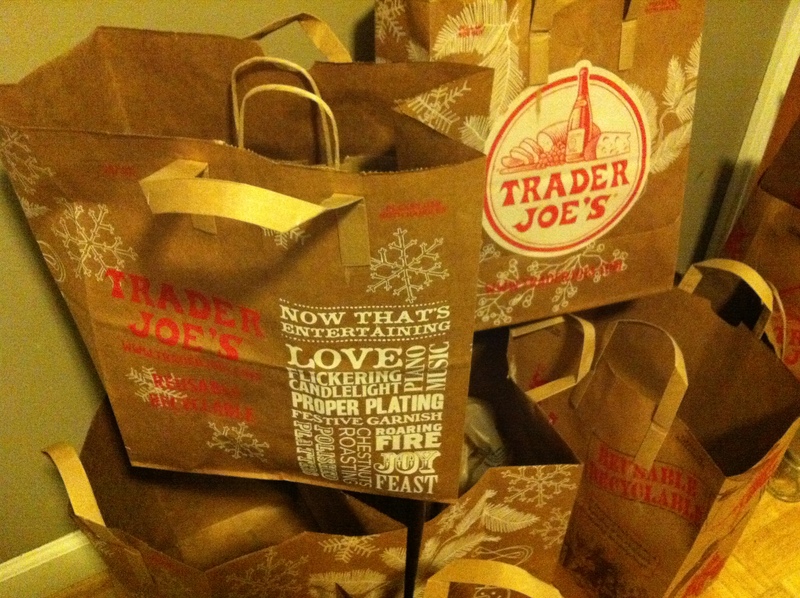 We don’t have Trader Joes in Hawaii so I have not seen these!!! I LOVE! I love all the fun things we do together as a family during the holidays. 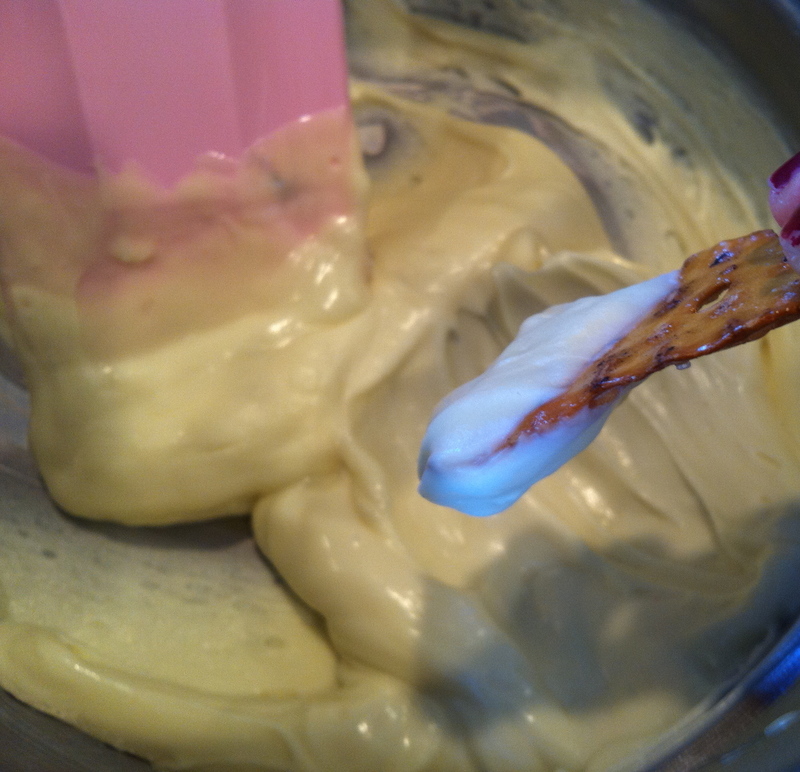 Although making yummy treats is certainly up there too. Those look great! Today was Fa-La-La-Freezing!! Not only was it frigid but it was windy!! I was forced to do my 5 miler on the treadmill. Today was also my LAST last day of school! Woo Hoo! 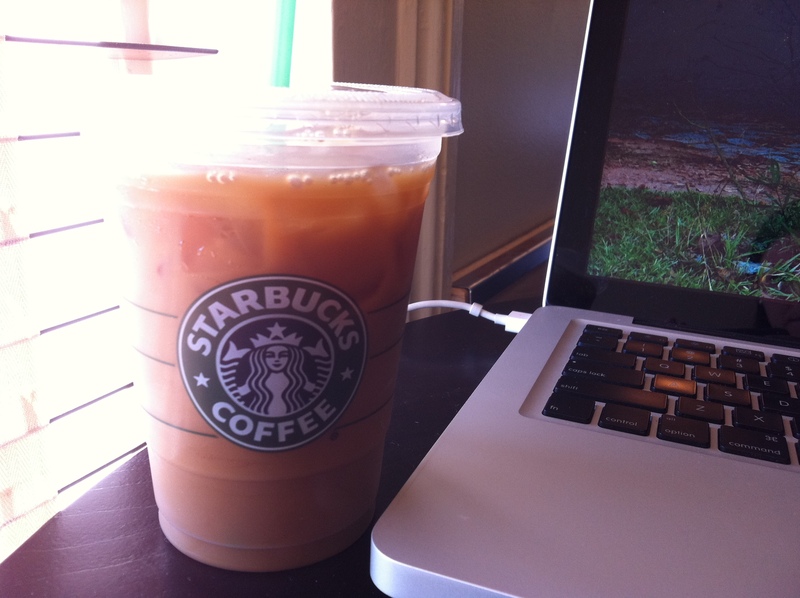 I love studying at this Starbucks, they never disappoint with samples! 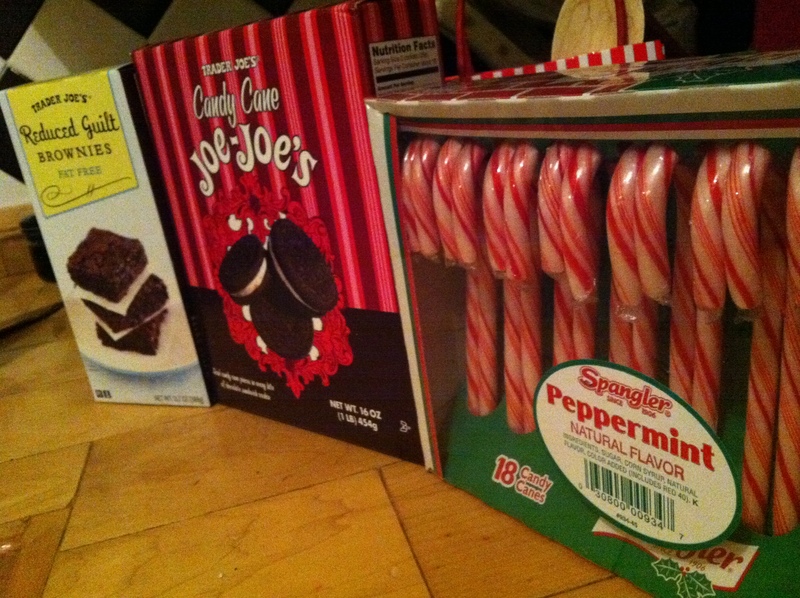 Candy Cane Joe-Joes’s- basically peppermint oreos…I KNOW! 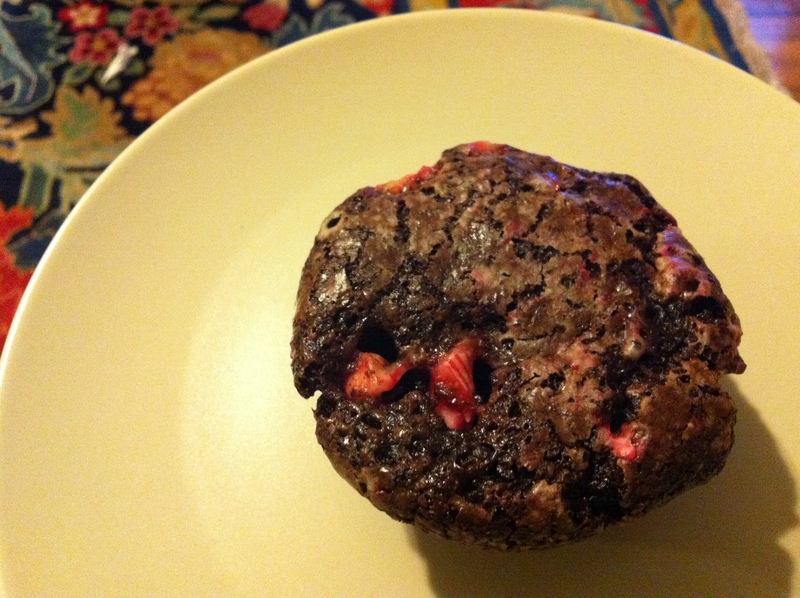 We combined the brownie mix with non-fat yogurt and 1/2 tsp peppermint extract. Divided half of the batter among 12 cupcake tins lined with paper. 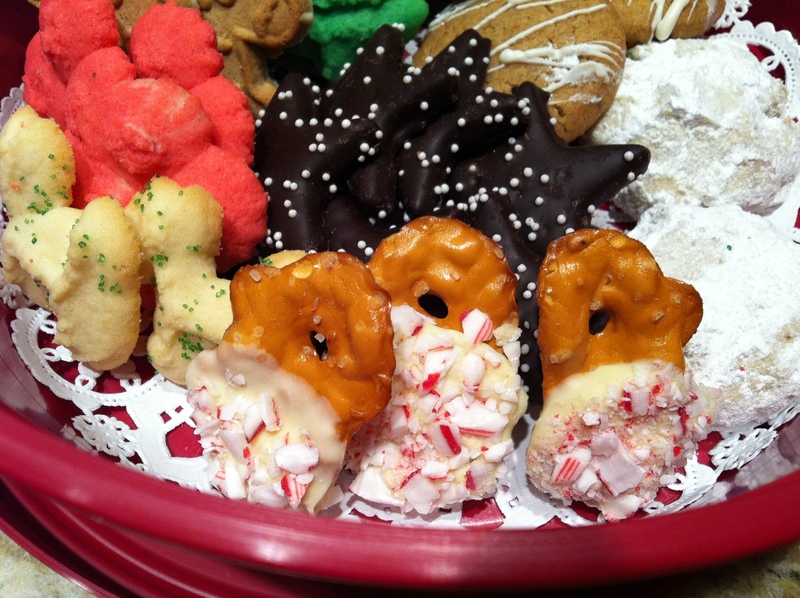 Top the batter with a candy cane joe joe. 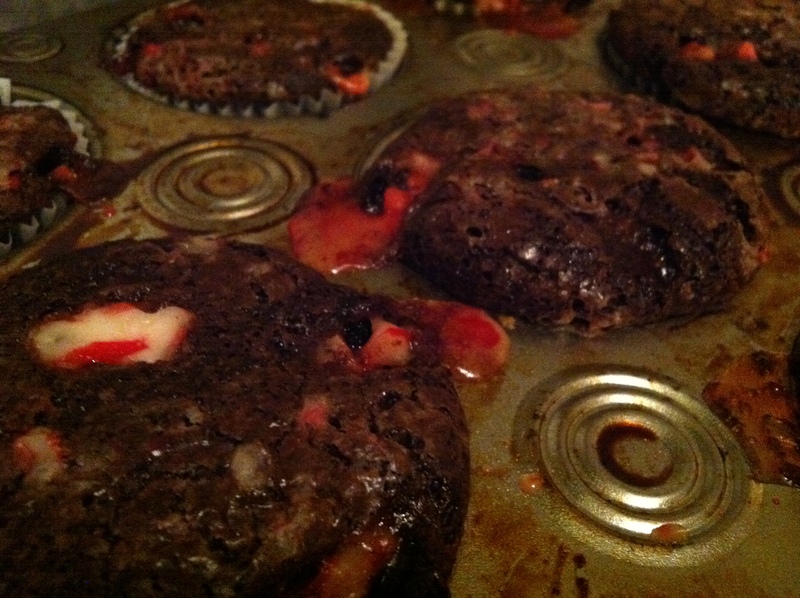 Top with the remaining brownie mix and sprinkle with crushed candy cane. Yummy!!! 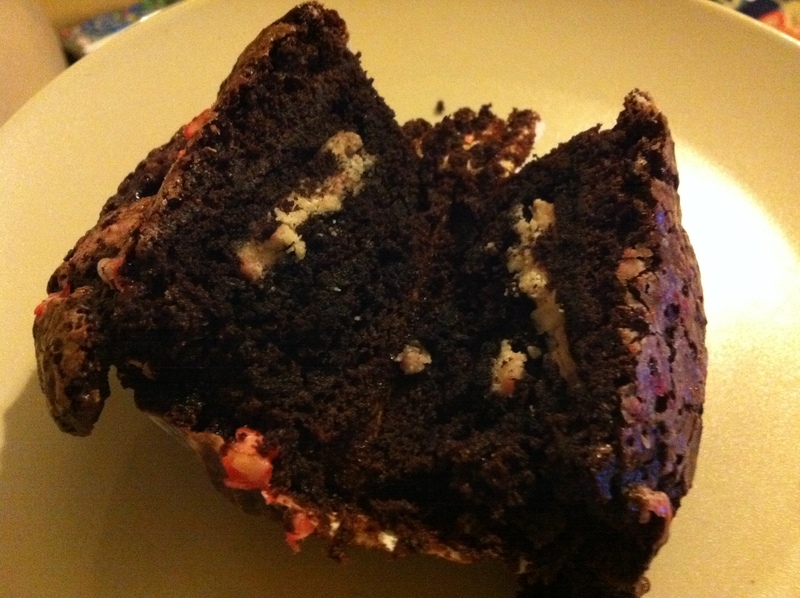 With a little peppermint surprise inside! 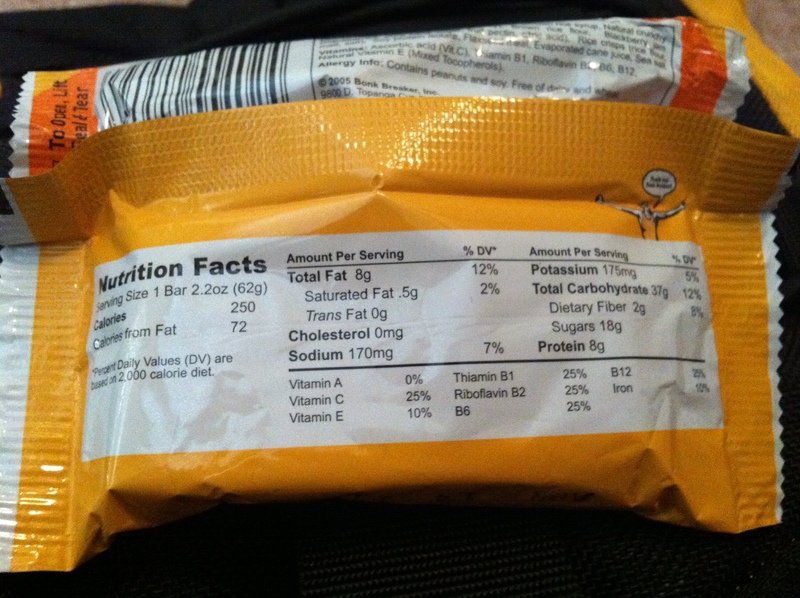 And they are under 200 calories each! 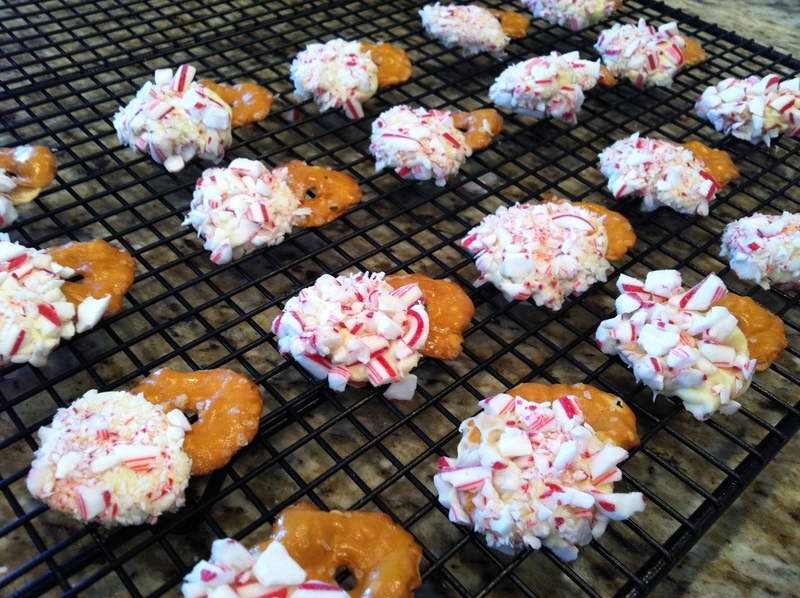 These really got me excited for Christmas cookie making when finals are all over! I’ll have to try the recipe. Me and the boys could use some carbs this week after the big game. I’ll be looking to sample some Southwest tasty salsa sensations soon. 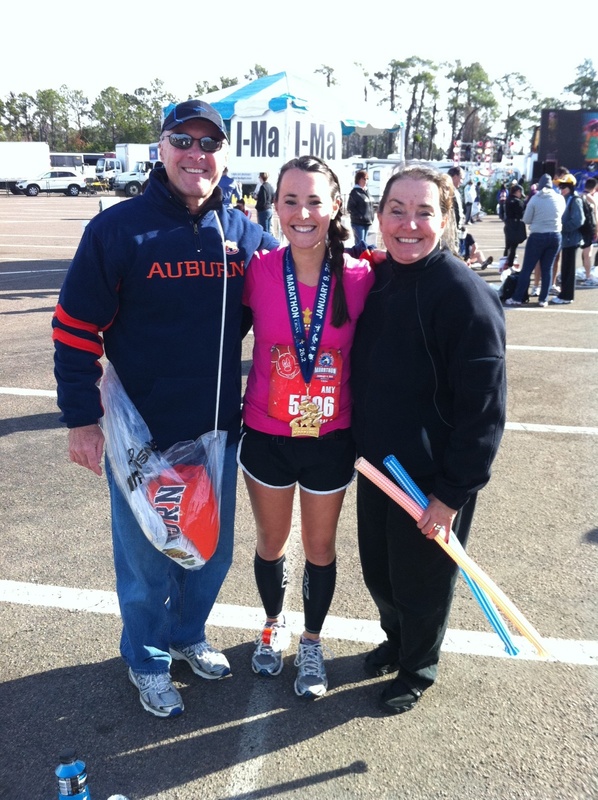 War Eagle Amy! surfacing only for tests and training 🙂 Check out the new page that shows my training schedule for the Disney Marathon! I am in week 4. 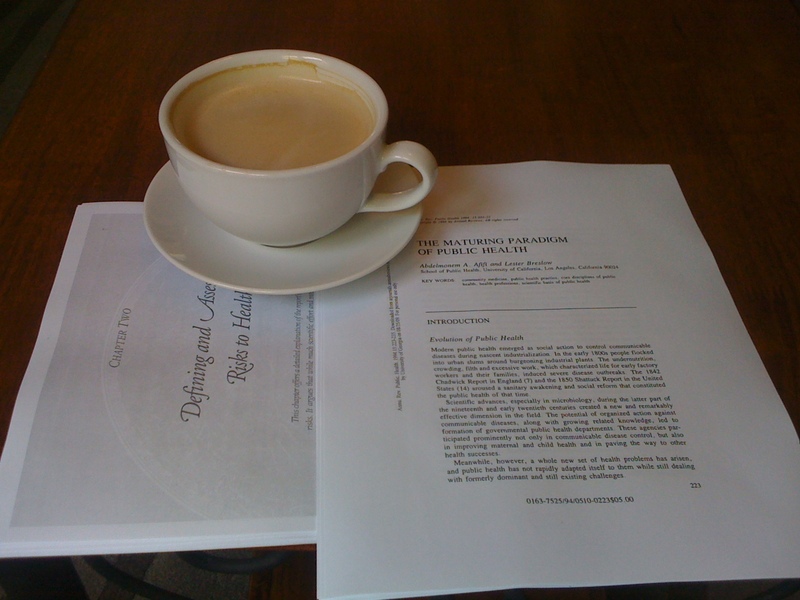 Although reading blogs is a great study escape, I don’t have time to post anything new (and not really anything exciting to talk about unless you want to hear about the plausibility of physical activity decreasing relative risk of coronary heart disease and ischemic stroke). 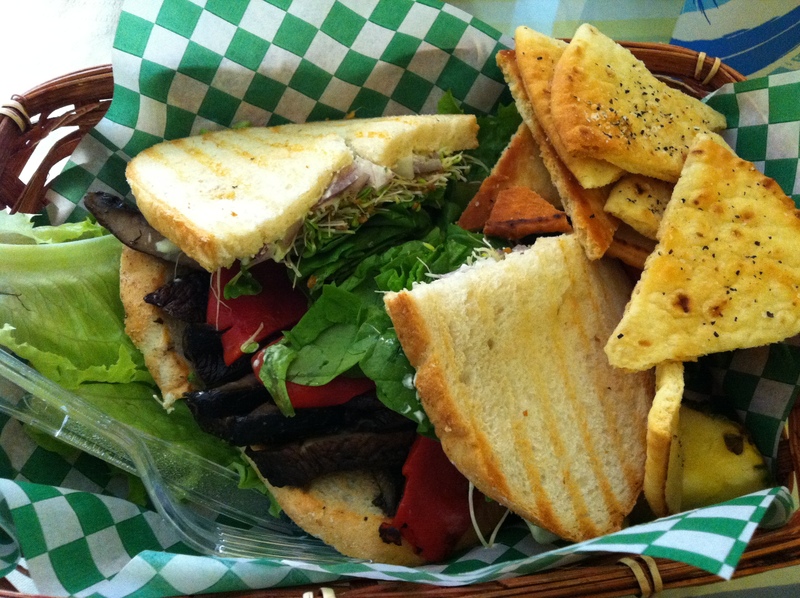 Loving leftovers from lunch with my mom on monday! 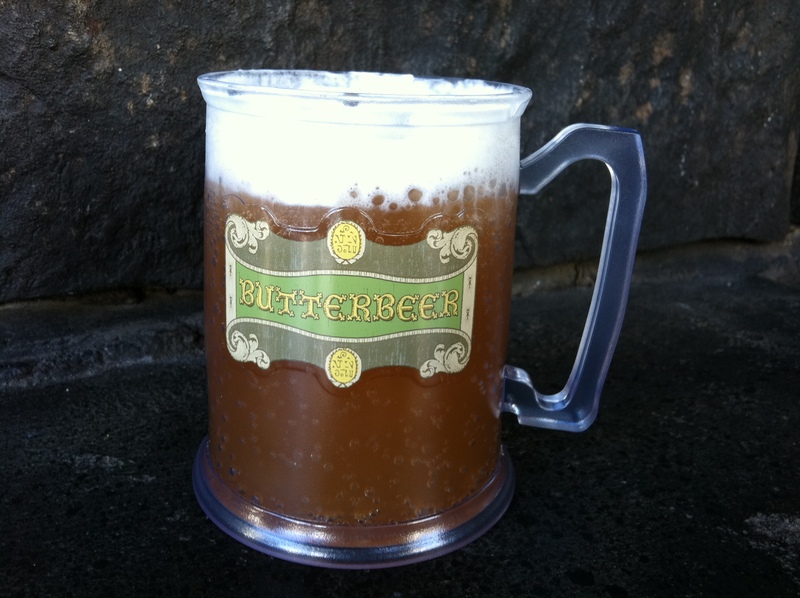 I am coming to the end of my first week of training for the Disney Marathon! My roommate Lauren and I thought that the best way to distract us from our last semester of grad school is to devote endless hours and miles to training for the most magical marathon around!! 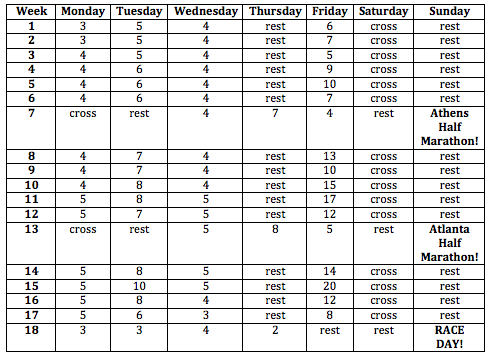 We are using Hal Higdon’s 16 week marathon schedule. 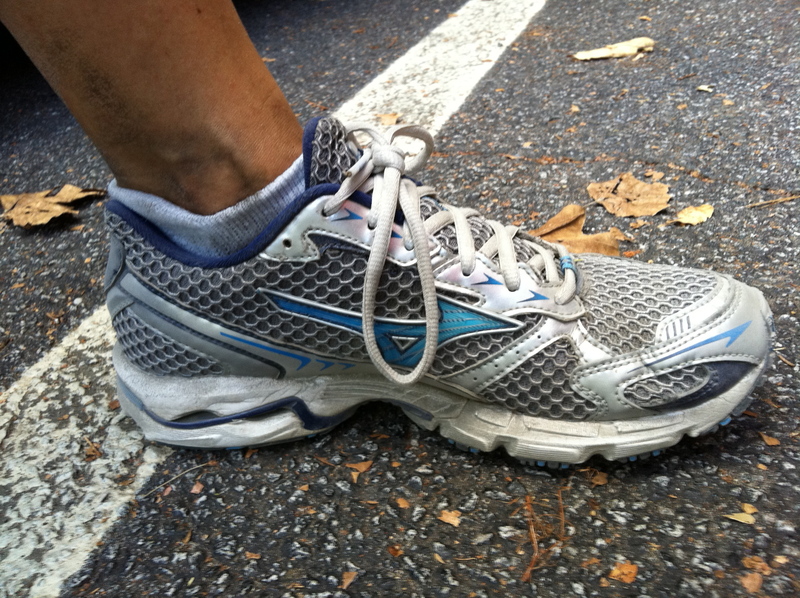 I used it when I was training for my first marathon – Chicago 2007. I made a few modifications to combine the beginner and intermediate plans. 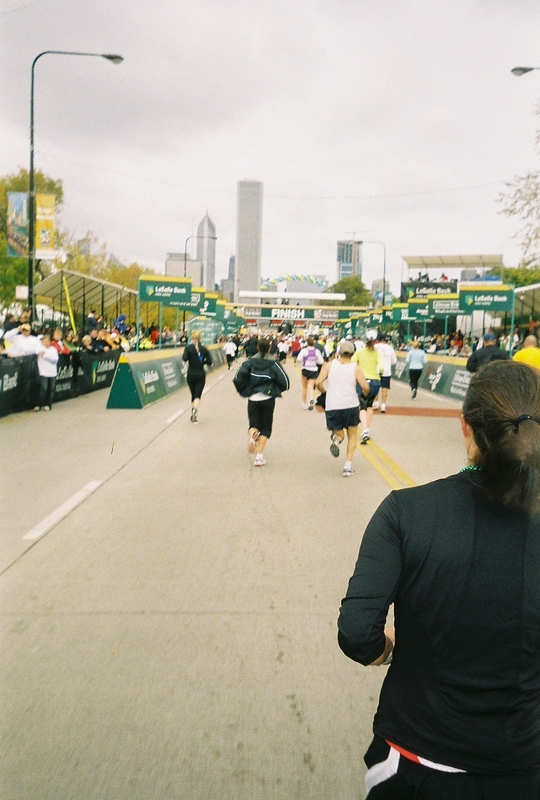 I have done one marathon and a few halfs so I don’t consider myself a beginner, however I don’t know that I am ready to take on the title of “Intermediate”. As you can see I have planned a few other events for this semester…so long GPA! But Athens is having its first half marathon ever (have to participate) and what better way to earn your turkey on Thanksgiving then running 13.1 miles?! Lauren and I woke up ambitiously early to put in our first 6 mile long run. Beautiful morning along Milledge Avenue, breathing in the commuters exhaust…alright so we will need to find a new place to run! 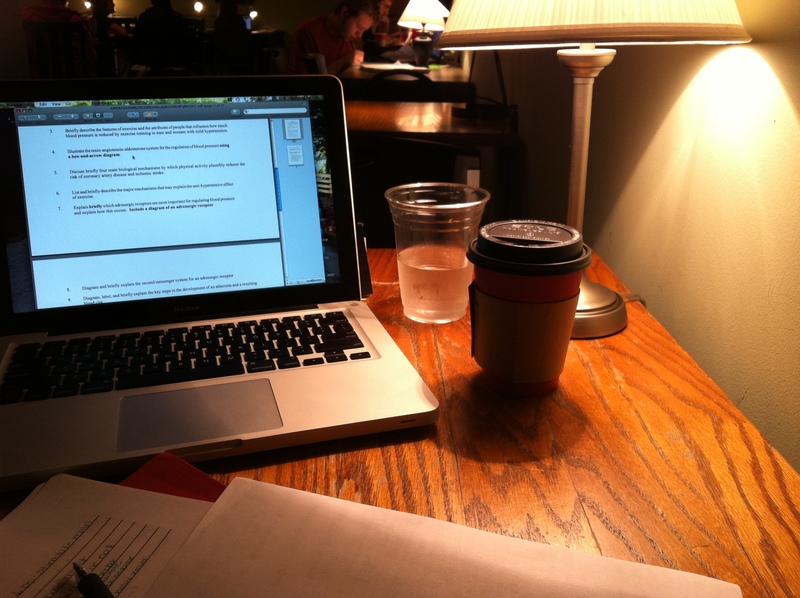 Then on to a full day of studying, I do want to graduate at some point. 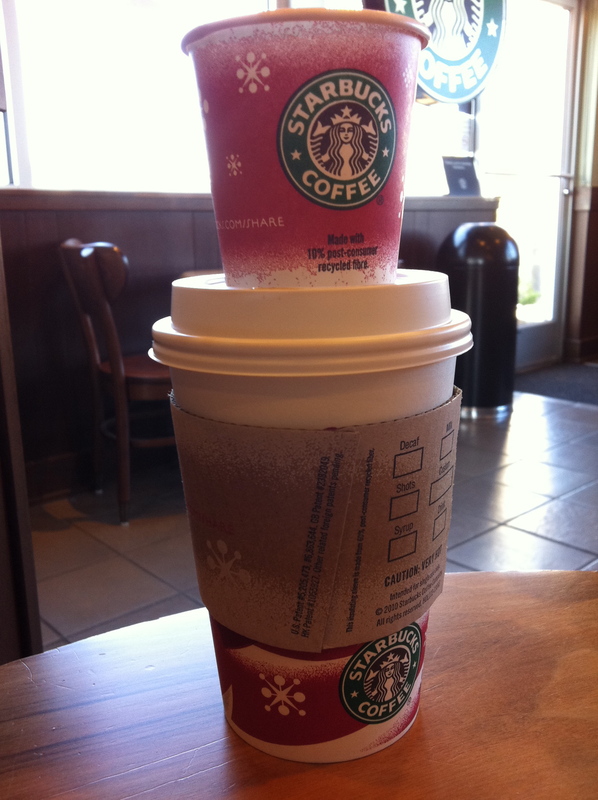 I packed my bags and headed to Starbucks for the seasons first PUMPKIN SPICE LATTE!! The best post race treat! 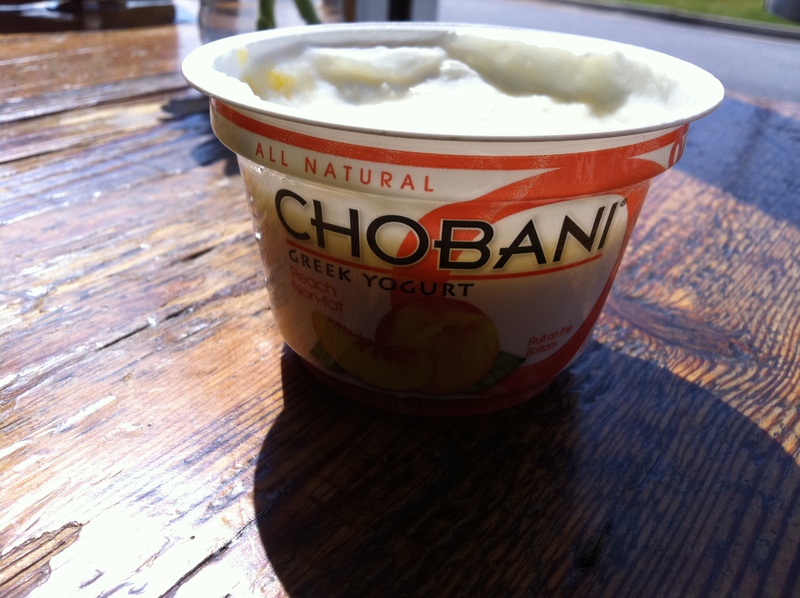 I followed up with a hummus wrap and my absolute favorite thing…greek yogurt! 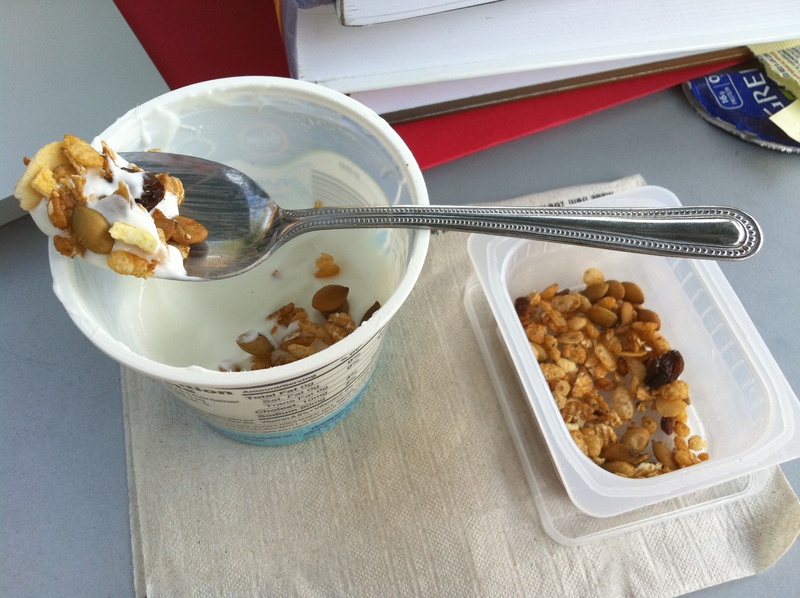 I sprinkled on some homemade granola (still perfecting the recipe, stay tuned). 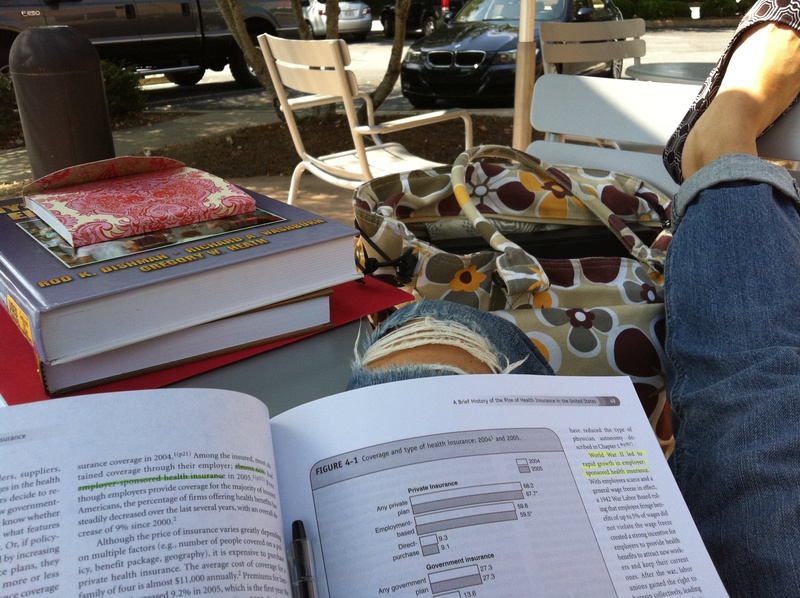 Then I sat back, opened my health policy book, and enjoyed the beautiful day. The best part is, I don’t have to worry about when I’m going to fit in a run later. What a great day! God Bless and all the very best! 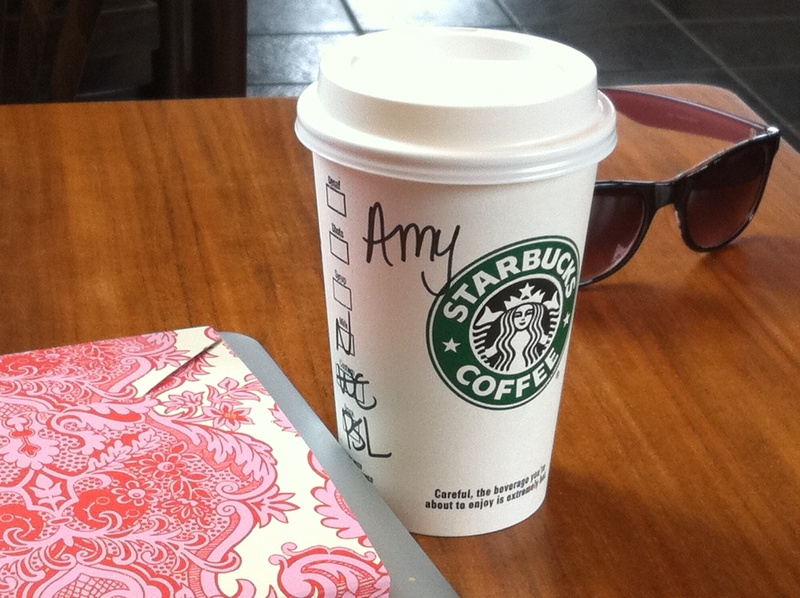 So cute Amy, Love it! Looking forward to training for my first Marathon with you- Disney here we come! ! ! 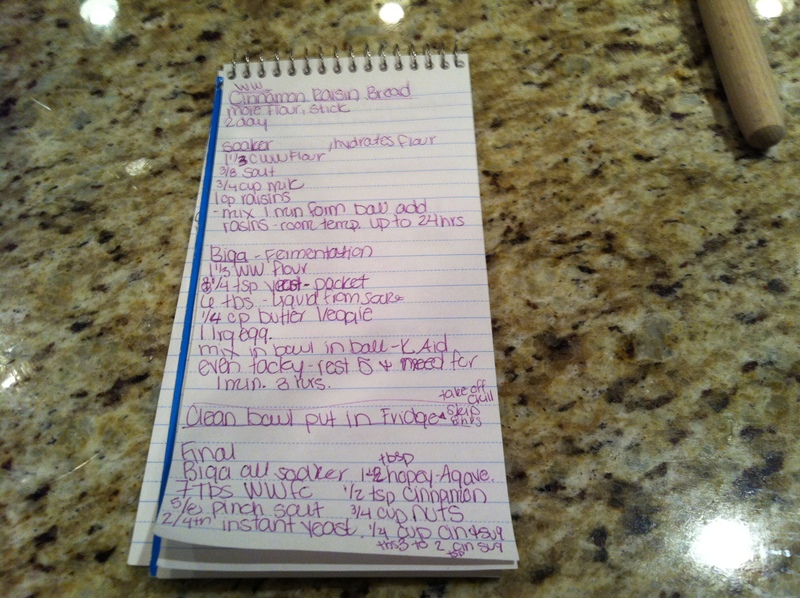 Keep them coming especially the recipes!! I’m not going to comment on everything, but I am impressed with the sharpness of the pictures. Very pretty. Thanks!! All of the pictures I take with my iPhone!